This house carries the history of a family that was of modest means, but rich in personality. 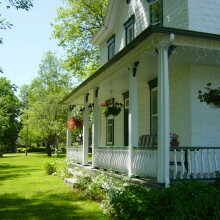 Many anecdotes, texts and photos of the poet Félix Leclerc and his family form part of the decor. Take a walk to the farm or to the river, on foot or by bicycle. Our fine, comfortable beds and hearty, delicious breakfasts await you. An unforgettable stay is promised! Your hosts: Georgie and Michel Leclerc.